This summer, Japan isn't the only country with enormous ladies. China is getting in on the act in a big way. The reaction in China, however, has been a huge letdown. 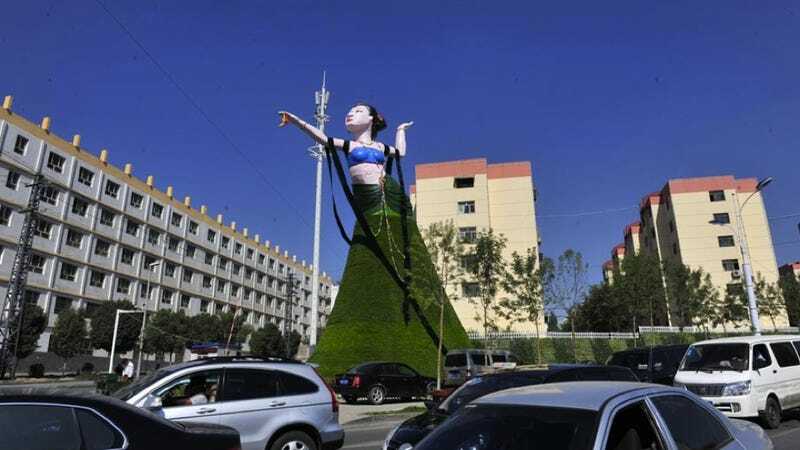 The above sculpture, which went up in Xinjiang province, depicts an Aspara, a celestial maiden for the clouds and water in Buddhism and Hinduism. The issue is that there seems to be a gap between what people online in China thinks looks beautiful and what the country's bureaucrats think looks beautiful. Some compared it to those paper items you burn for your dead ancestors, while others immediately dismissed the statue as either "ugly" or "frightening" or both. Some said it looked nothing like an Aspara. One individual even compared the figure to a blow-up doll, and another thought this might be a ruse to lower the price of real estate around the statue. The government officials probably had no idea this would become such a big deal online. Update: This statue was actually taken down—seemingly because of the online outcry.